Some of my first porcelain sculptures and relative sizes. 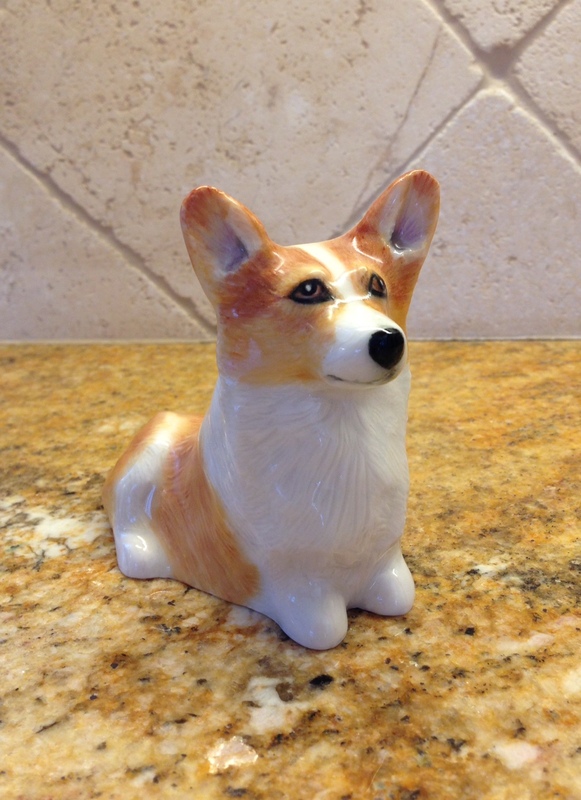 I started doing porcelain sculptures in early 2013, with the guidance of good friend and fellow collie breeder Laura Weiss. 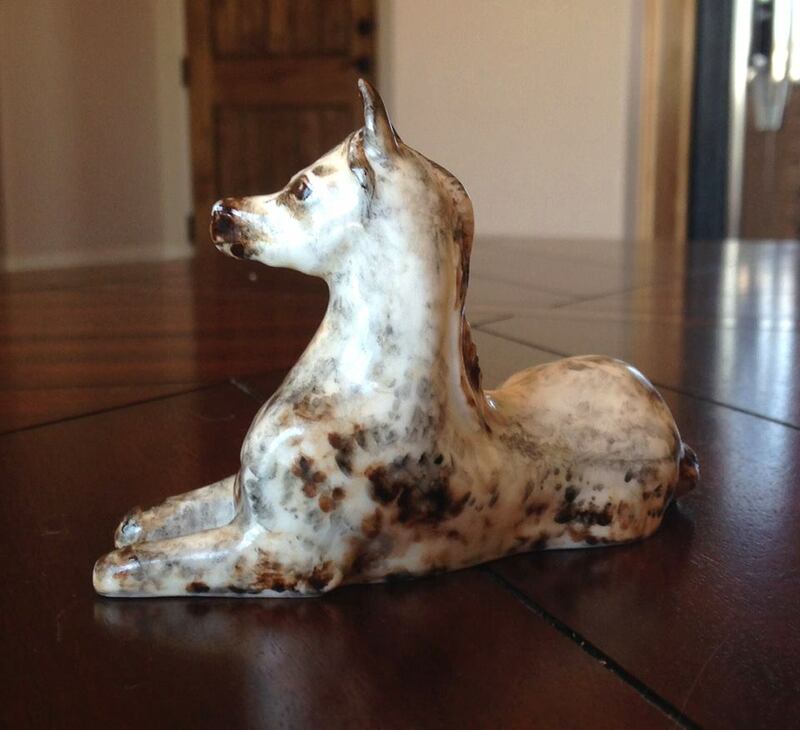 I had already sculpted and designed the trophies for the 1997 Reno, NV Collie Club of America National in bas relief/resin and was a big fan of that type of sculpting. Working in full body sculpture and pouring porcelain slip was a kick and brought on a whole new level of excitement in my art that I was missing for several years. I have enjoyed the whole process, from the initial sculpting, to learning how to make my own molds. China painting the final glazed pieces was the cherry on top as I found it like painting in watercolor. All of my porcelain pieces, so far are from my original molds, but each piece is still hand done, after it comes out of the mold. No two pieces are identical in how the molds are "re-sculpted" and painted/fired. Feel free to contact me with any questions and or commissions. Thank you! Arabian in Porcelain (Unfired) 5 1/4"W x 4 1/4" W x 1" H ~ I have a limited number of this bas relief, in different colored glazes. $65 plus S&H. Contact me for details. White glaze & Metallic glaze. 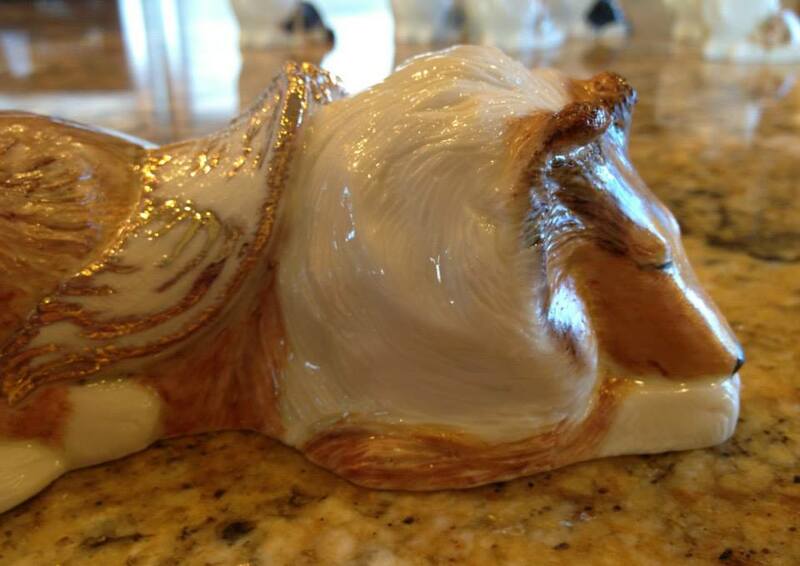 "Khaliq Laying In Grass" Porcelain Sculpture ~ 4 3/8"L x 3"H x 2"W ~ $115 plus S&H. 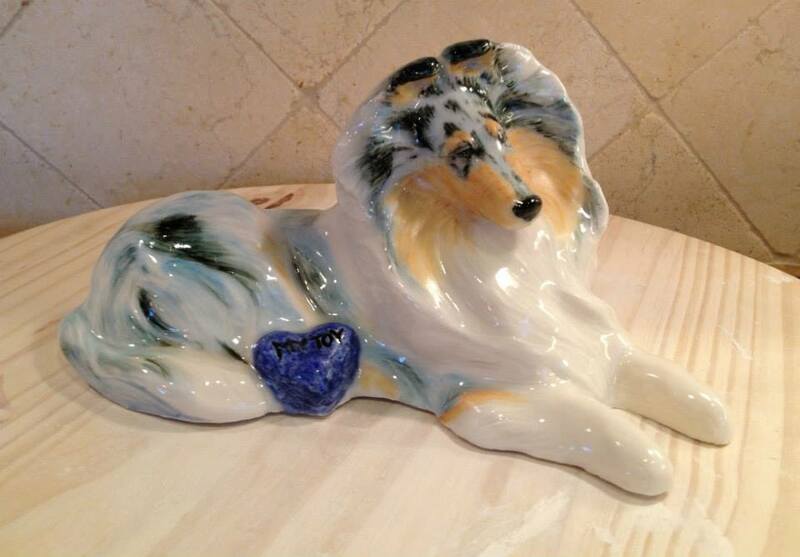 "Sitting Sheltie" 2 3/4"H x 2 5/8"L x 1 3/4"W ~ $65 plus S&H. 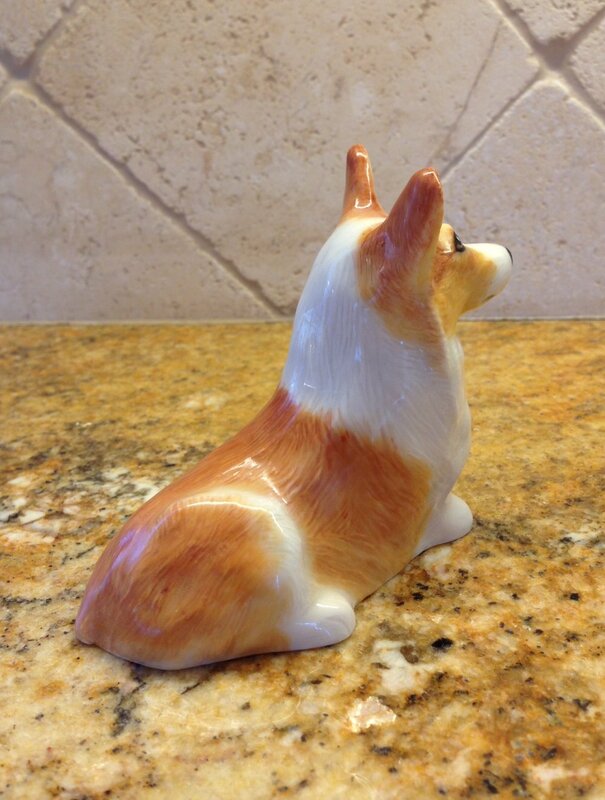 "Sitting Collies" 5 5/8"H x 4 1/4" L x 3 1/2"W ~$110 plus S&H. "Soleil W 4 Pups" ~ 2 5/8"H x 6 1/8"L x 3 1/8" W ~ $110 plus S&H. "My Toy" 4 3/4" H x 9 1/2" L x 4 3/4" W ~ $175 plus S&H (w or w/o dog bed). Punky Angel ~ 2 1/4" H x5 3/4"L x 2 3/8" W ~ $110 plus S&H. "Sage & Thrill" $110 plus S&H. Austrailian Shepherd ~ $95 plus S&H. Smooth Collie (Companion piece to "My Toy" and same approx. size) ~ $175 plus S&H (w or w/o dog bed).